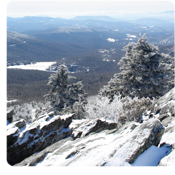 Grandfather Mountain is open daily throughout winter, weather permitting, with the exception of Christmas Day. When winter weather arrives, however, visitors are encouraged to call the Entrance Gate at (828) 733-4337 to confirm the day’s conditions and set the stage for a memorable outing. During times of inclement weather, including snowy, icy and windy conditions and extremely low temperatures, the mountain may close entirely or halfway, meaning no access to the Mile High Swinging Bridge until conditions improve. If the park is closed halfway, guests may visit for half-priced admission — even if the remainder of the mountain opens during their stay. For questions concerning hours, openings and closings, please call the Grandfather Mountain Entrance Gate at (828) 733-4337.